If you’re a Walking Dead fan (and if you aren’t, you just haven’t read it yet), then you know they screened a trailer for AMC’s upcoming TV adaptation at this year’s Comic-Con. I wasn’t there, and folks who were told me it looks promising. So I watched the bootlegged version (it’s all over YouTube). Obviously, that isn’t the way this footage was meant to be seen, but it still concerns me. It all feels a little too…I dunno, “made for TV,” I guess. Plus, the book is in black and white (and gray), the impact of which can’t be underestimated. In a title that’s all about human frailty and moral ambiguity, the grayscale itself is a sort of subtle signifier. Technicolor doesn’t seem to make the same statement. That’s why I was so pleased to find the above motion-comic footage, which is, to my mind, a much more satisfying way to make this story move (if they must). Yet I still contend that not every good book should be made into film of some sort. I think that’s ultimately missing the point of reading. But enough of my yappin’. What’s new in the comic world? Tons of stuff, very little of which concerns me. Still, I have a whopping three books on my pull list this week, so let’s take a look at what awaits me behind the counter of Comics Unlimited today. 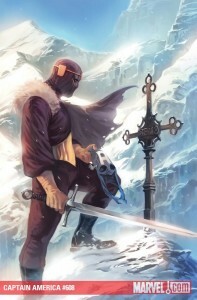 Captain America #608 continues the tale of Baron Zemo’s battle with perma-temp Cap, Bucky Barnes. The REAL Captain America (or whatever he currently is), Steve Rogers, is still off somewhere in the Nine Realms, stuck in a bad fantasy novel. Well, speak of the devil (not the Devil, that’s one book down). 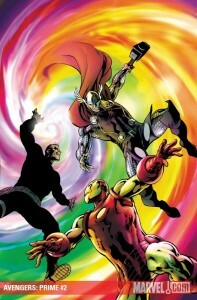 Avengers: Prime #2 features the Big Three—Steve, Tony, and Thor—lost in a world adrift. Or something like that. As I recall, Rogers was about to go toe to toe with some trolls. This is about to get interesting. Or terrible. One of the two. Last (and quite possibly least), it’s Shadowland #2! The previous issue ended on something of a cliffhanger, with Bullseye appearing to have bought it. Then Marvel put out some comic that showed him in a casket or something…I didn’t read that. So as far as I know, it’s still up in the air whether Bullseye is dead or not. Even if he is, he probably isn’t. You know how these things are. Anyway, I guess this book is about Matt Murdock finally being pushed too far (his costume is BLACK!! 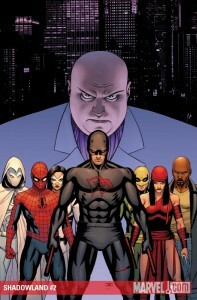 )—but, honestly, being pushed too far is pretty much Daredevil’s whole deal these days, so…meh. Finally, seeing as how the cover has a whole lot of other characters on it, I expect them all to show up real soon and start ruining things even more. But not for Matt Murdock. For me.